Would you like to request a quote? Click the request a quote link and include the information listed below. 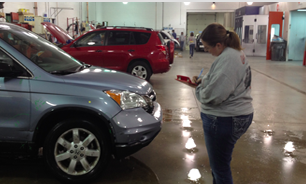 Once an estimate is written we will be able to tell you how many days it will take to complete your vehicle's repairs. CAN I GET MECHANICAL WORK DONE WHILE MY VEHICLE IS IN THE SHOP? Yes! Let us know any other work that you would like done while your vehicle is here. 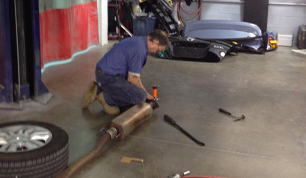 We are a full service mechanical & collision repair facility. Your state inspection can be done 3 months prior to expiration. WHAT IS A CLAIM NUMBER, AND WHERE CAN I GET ONE? Your insurance company will issue a claim number to you when you report your accident. Bring that number to us, and we will work directly with your insurance company to complete the repair process. WILL THE PARTS BE ORDERED BEFORE I DROP MY CAR OFF? Yes, once your estimate is written and we have a confirmed scheduled date we will order parts one week prior to your arrival date. ARE YOU CAPABLE OF WORKING ON ALL MAKES AND MODELS? Yes, we are able to work with all vehicles, domestic and import. If there is a diagnostic problem that is dealer related we will work directly with the dealer to fix that issue. ARE RENTALS AVAILABLE AT THE SHOP? We do not supply rentals, however we work directly with Enterprise Rent-A-Car and Hertz Rental. Both companies will meet you here at the time you scheduled with them for rental. We take great pride in our color match. We are able to match colors due to a procedure called blending. We are proud to announce that we have "gone green" and are spraying PPG latest waterbased paints. This paint is not only better for our environment but also better on color matching! A total loss is determined by the value of your vehicle and the cost of the repairs. Our estimating system gives us a general idea of the value in your vehicle however your insurance company will determine the final value. Your deductible, which is determined by your insurance company, and is due to us at the time of pick-up. We accept cash, personal check, Visa, Mastercard, American Express, and Discover. Betterment charges are determined by your insurance company. These charges are for parts that are damaged by the accident but are worn due to regular wear & tear. Examples of these parts are tires, batteries, exhaust, etc.